Oooh, I’ve done myself proud today with this recipe … even earned brownie points with the boyfriend at dinner. Finger lickin’ good! 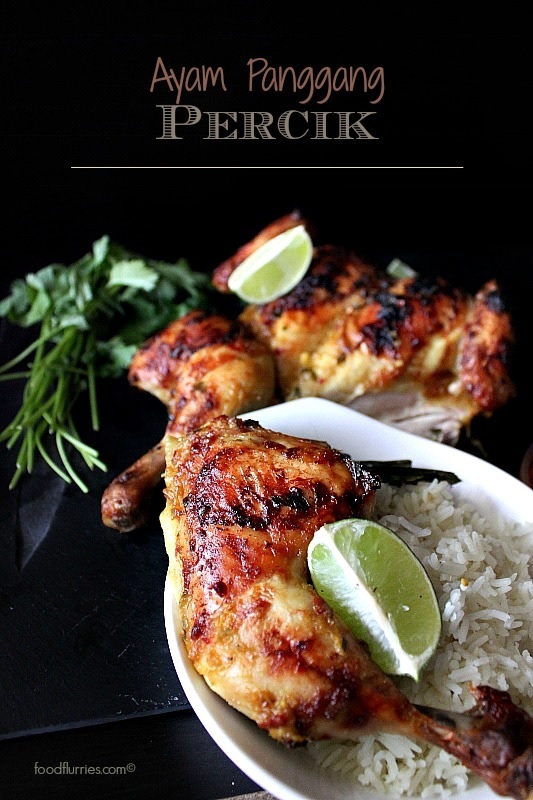 Ayam panggang percik is Malay for roasted chicken in aromatic paste. This is a beautiful dish that originates from the east coast of Malaysia, namely in the northern states of Kelantan and Terengganu. 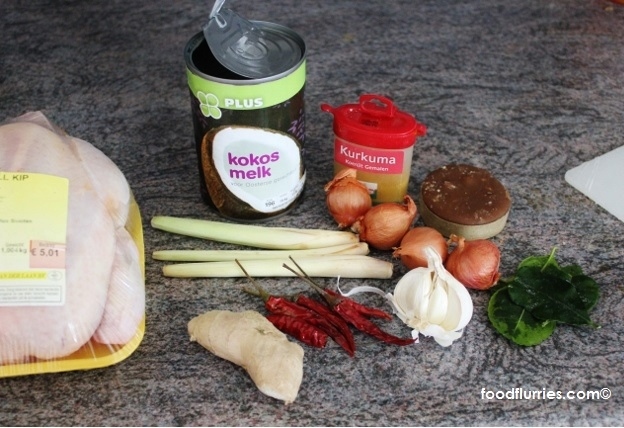 Lemongrass, ginger, garlic, chillies and shallots are mashed to a paste and slowly cooked off in coconut milk to form a marinade. Then this is rubbed generously all over the chicken and left to perfume the meat for a good few hours before whacking it over a charcoal grill. Cooking the chicken this way imparts yet another dimension of flavour as the charcoal gives the dish a hint of smokiness. Sometimes many chicken are skewered on a spit and roasted en masse at large village gatherings to feed a crowd. 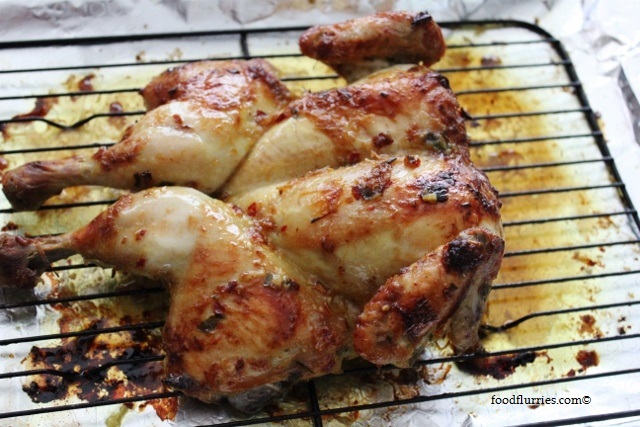 If you don’t have a large bunch of people coming round to justify cooking out on the barbecue, or you simply do not own one, then it’s no bother coz this recipe can easily be made in the oven. Just make sure your oven also has a broiler function to crisp up the skin. Initially I was apprehensive as to whether I could produce the same results in my oven … and I guess, judging by the pictures and the taste test at dinner, it works just as well (just minus that smokey flavour). I have been hankering for some good ‘ol southeast Asian food with big flavours and for some reason my mental taste buds took me specifically to this recipe. 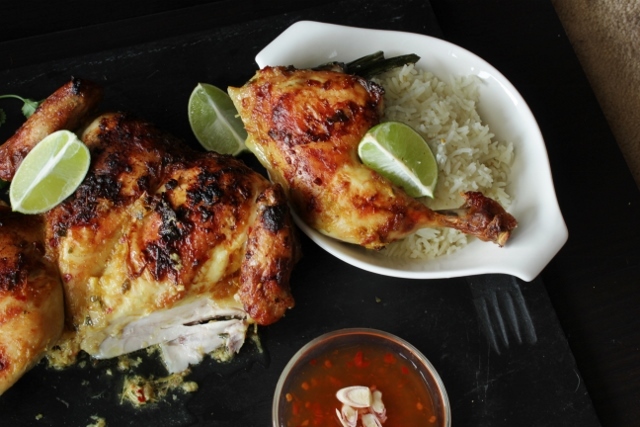 As a child we used to get some pretty decent roast chicken from our local Ayamas deli. Their roasts were famous: honey roast, black pepper, classic roast and of course, the ayam percik (ayam means chicken). Of all the flavours the percik was my favourite. Later on in life I took Mum with me for a short break to the east coast. 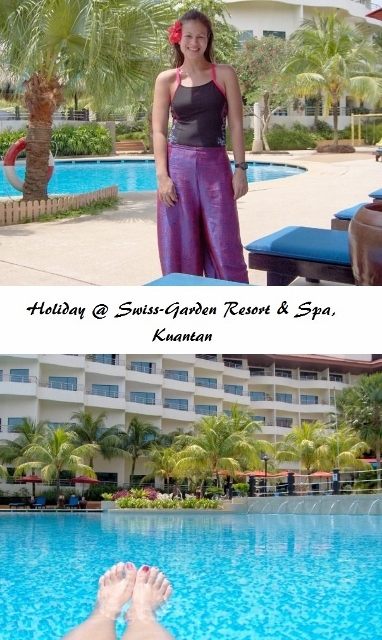 We stayed at the Swiss-Garden Resort & Spa for a blissful 5-day vacation, and for dinner the hotel had this enormous spread of local food. Once again I was reunited with this scrumptious chicken dish, roasted to smokey perfection in the expert hands of the local cooks. I was in heaven. Haven’t had any since … until today. 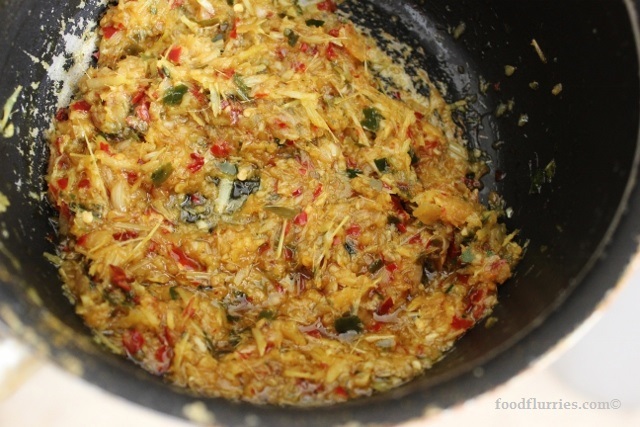 Place the shallots, garlic, ginger, kaffir lime leaves, lemongrass and chillies into a blender and blitz to a fine paste. Be sure to only add the leafy part of the kaffir lime leaf into the blender. Discard the spine. Heat oil in a non-stick pan and gently fry up this paste until fragrant and oil rises to the top. Then add in the palm sugar and continue cooking until it melts fully. Palm sugar is made from the sap of the sugar date palm tree and it is a common ingredient used in all south Asian cooking, especially in desserts. It’s like our version of demarara sugar, but it comes in cakes or blocks. It has a distinct deep amber colour and a unique flavour … a sort of caramelly taste. 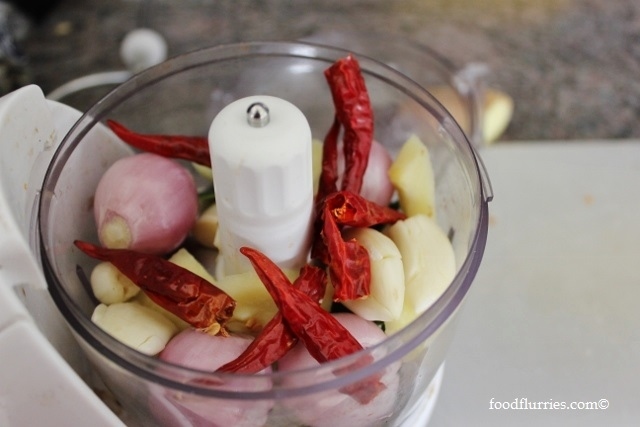 Once your spice paste goes a shade or two darker, it is time to add the coconut milk and fish sauce. You don’t want to add too much liquid because you want a paste that you can rub all over the chicken later. Adjust the amount of sugar vs fish sauce according to your taste. A good balance should give you a nice pungent flavour at the beginning, finishing off with a hint of caramelly sweetness at the end. The sugar in this marinade will give the chicken a nice colour. Turn off the heat and set this mixture aside to cool completely. Meanwhile, let’s prep some chicken. I am using a whole bird, but you can also use drumsticks, thighs and marylands. Always cook chicken with the bone in for a juicier finish. Here I have prepped my chicken by removing the spine, flipping the bird over and smooshing it down, cracking the breastbone. Tuck the wing tips under themselves to avoid burning them. Season very well with salt and rub all over on both sides. Cutting the chicken this way enables you to easily season the bird on all sides to maximize surface area and flavour. 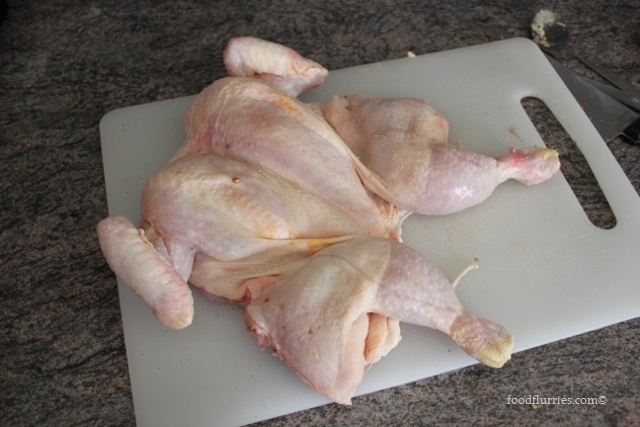 To get a nicely baked skin, be sure to pat the chicken really really dry before you season with salt. Wet skin will never give you that nice golden colour, and it will taste bland. 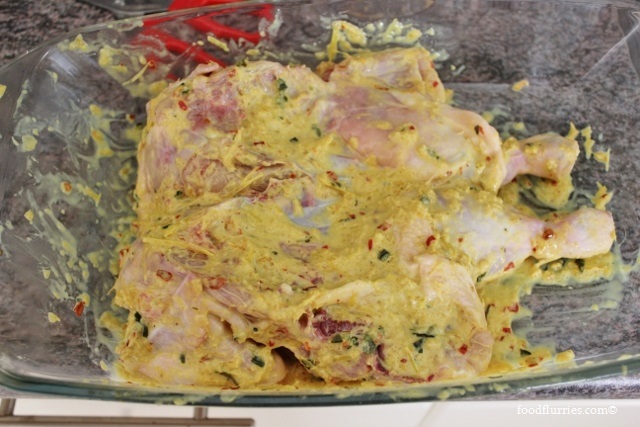 Place the entire chicken into a glass dish and rub all over with the marinade paste. Shove it into the fridge to rest for 4 – 6 hrs … overnight is even better. 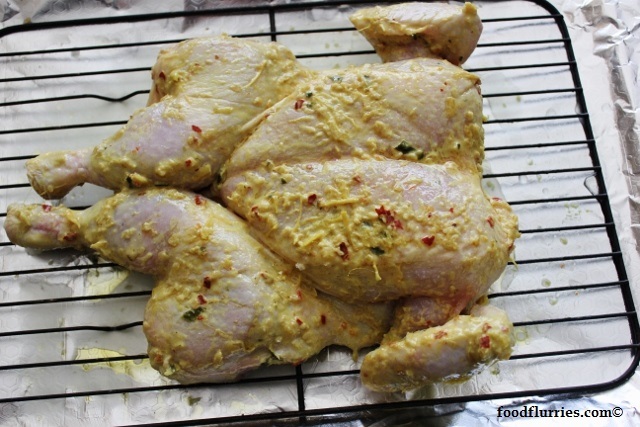 When it is time to cook, place the chicken onto a roasting rack to keep it off the bottom of the tray. Again, this is to prevent the chicken from sitting in its own juices and it helps to crisp up the skin by allowing air to flow underneath. I then place the rack onto a baking tray lined with heavy duty aluminium foil to catch the drippings. To prevent scorching, I also pour half a cup of water onto the tray. This liquid, combined with the drippings, will then be used to baste the chicken during the cooking process. Roast at 200ºC for the first 20 mins, then reduce the heat to 170ºC for the next 40 mins, middle rack of oven. After an hour it will look something like this. It’s cooked, but the skinn needs a bit more colour, so baste with the liquid that has collected at the bottom of the pan there and return the chicken to the oven, under the broiler for 5 mins. And what you end up getting is a beautifully roasted chicken that is not just cooked all the way thru, but is still juicy, moist and tender inside, especially the breast bit. Always rest your roast for at least 15 – 20 mins before you cut into it to allow the meat to relax and allow all the juices to get reabsorbed into the flesh. Don’t worry, it will still be hot when you finally get to tuck in. This gives me ample time to style and photograph this dish today, even tho the hungry boyfriend ended up hovering behind my back towards the end. To serve this chicken I made some coconut and pandan rice; totally optional, as plain white rice will do just as well. But I really wanted something to complement the savoury aromas. I simply put rice in a saucepan with cold water, added some of the extra spice paste (didn’t want any to go to waste), poured in about half a cup of desiccated coconut flakes, salt and two pandan leaves, knotted. Then cook the rice as per usual until all the liquid has been absorbed and the rice is cooked through. If you want more flavour, as the rice is simmering away, grate in some extra fresh ginger and a clove of garlic. 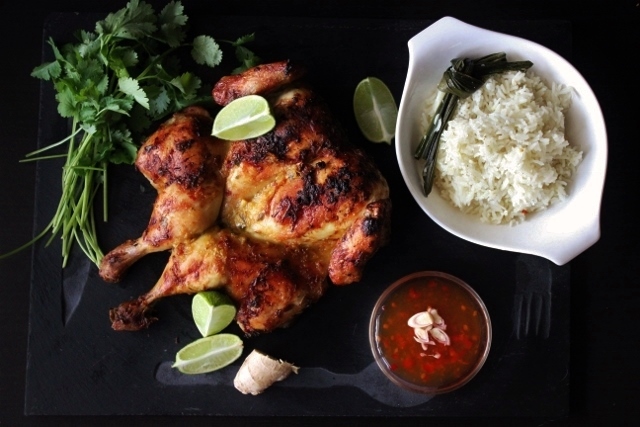 This rice will come out brilliantly fragrant and flavourful, and it will complement the roast chicken and some sweet sambal. I have decided to cheat a little and use bottled sweet chilli dipping sauce and mix in some sliced lemongrass. Once the chicken has rested enough you can cut into it and you will see just how tender and juicy it is. In fact, no knife was really ever necessary in cutting into this bird, R. and I simply tugged with our fingers and everything just kinda peeled away nicely with very little resistance. This was the first time R. was trying ayam percik and he absolutely LOVED it. I even had to fight him for my fair share of chicken. While the skin may be a touch spicy, but the inside had just enough heat for my palette. Would be a good idea to serve this up with some cooling raw vegetables, or as the Malays call it ulam-ulaman. Great write up. I’m literally salivating right now. Thank you for the recipe and instructions. Will definitely try this out. I take it that you lived in Malaysia for a while and now you’re back in Holland? Hi. I tried your recipe yesterday and it’s great! My friends love it. Is it ok to share your recipe with them? Thanks. Looking forward to trying out more of your recipes.